Image Credit: ESO L. Calçada/N. Risinger. This Jupiter-like Planet is known as Beta Pictoris b, it's a gas giant that's situated 63 light-years from Planet Earth and roughly 10 times more gigantic than Jupiter. Observations from the ESO's Very Large Telescope measured its revolution rate, a blazing 62,000 mph i.e. 100,000 km/hr at the equator, so its day is merely eight hours lengthy. That's a truly short period related to the Earth's 24 hours, but we're revolving at a modest 1,060 mph. Beta Pictoris b is distinctly bigger than our solar system's biggest planet, Jupiter, by comparison, Jupiter's equator spins round about 29,000 mph, making a day 10 hours long. "It is not known why some planets spin fast and others more slowly," daid co-author Remco de Kok in an ESO report, "but this first measurement of an exoplanet's rotation shows that the trend seen in the Solar System, where the more massive planets spin faster, also holds true for exoplanets. This must be some universal consequence of the way planets form." 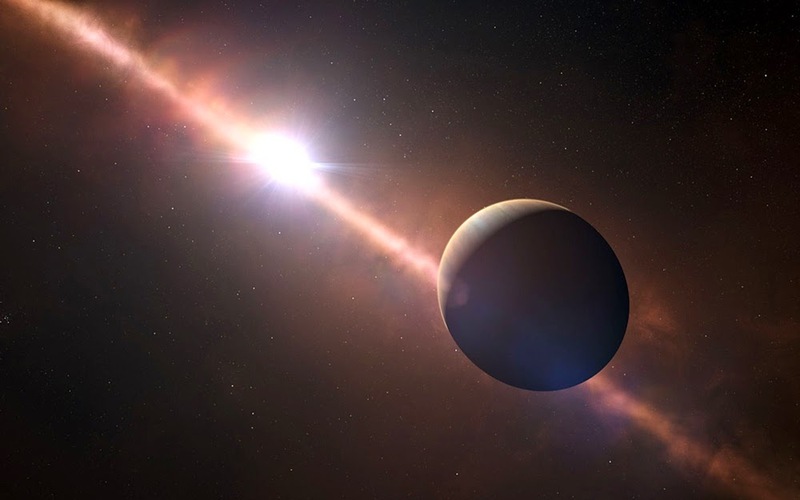 At 20-million-years-old, Beta Pictoris b is a fresh planet, but with time, it's projected to cool and contract, which will create it spin even faster.